The service was taken down after users started receiving random pop-up messages on the Chrome and Windows version. 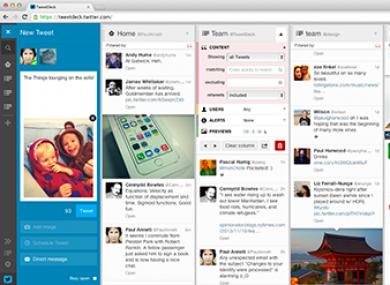 ALL VERSIONS OF TweetDeck have been taken down after a major security flaw was discovered. The security flaw involves XSS (cross-site scripting), a computer vulnerability mostly found in web applications which allows hackers to inject script into webpages to help them access user accounts and other sensitive data. One instance of the bug caused one tweet, containing nothing but code, to be retweeted by other accounts. When the flaw was discovered earlier today, Tweetdeck tweeted that the problem was fixed and asked users to log out and in again. However, it tweeted again saying it was taking down all versions of the service to assess the issue. If you can still access Tweetdeck, it’s recommended you sign out of the service and deactivate it on Twitter.com. By going into settings and apps, you can revoke access of Tweetdeck as a precautionary measure. The service tweeted another update to say the security issue has been fixed. Again, make sure to log out and log back in again to ensure the update has been made. Email “Tweetdeck takes service down after security flaw was discovered”. Feedback on “Tweetdeck takes service down after security flaw was discovered”.